MacGregor, part of Cargotec, is continuing its development of innovations designed to enhance and serve the growing wind energy market. As part of this process, it is participating at the Offshore Wind Energy 2017 event being held in London, UK, between 6-8 June. "The project hinges on applying proven technology in new applications," says Torbjörn Rokstad, Director, Mooring Systems, MacGregor. "MacGregor was chosen for the task because of its long history of designing and delivering very reliable mooring solutions for offshore floating production units operating in harsh North Sea conditions." All wind turbines require regular inspections and maintenance, which can be a challenging task in harsh offshore environments. MacGregor has developed and delivered full three-axis motion-compensation technology, which can enable a crane to keep a suspended load in a fixed position relative to the turbine platform. This is an important capability when landing containers of tools, equipment and personnel onto the small platforms at the top of offshore wind turbine foundations with little margin for error. It is also ideal for maintenance work on these turbines and other fixed installations. Caption: For wind turbines' regular inspections and maintenance, MacGregor full three-axis motion compensation crane offers safe and precise operation for landing containers of tools, equipment and personnel. "Turbine platforms are about 20m above the water and they are often only a few square metres, so precise load- and personnel handling is necessary," says Mr Rokstad. "Although MacGregor's standard active heave compensation (AHC), supplied through a crane's winch, compensates for the vessel movements; a greater degree of precision is sometimes needed." 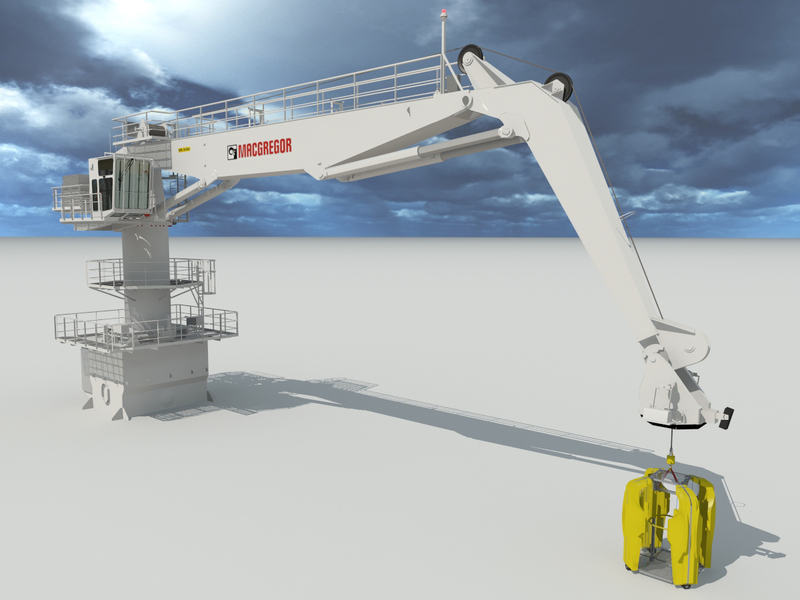 In line with this, last year MacGregor introduced the 3D Motion Compensator (3DMC), a flexible retrofit device, which is designed to enhance the load-handling precision of an offshore crane even in challenging sea states. The 3DMC can be fitted to the knuckle-jib of a broad spectrum of new or existing MacGregor subsea/offshore cranes. It compensates for the roll, pitch and heave motions of the vessel to minimise any movement of the load when lifting to and from fixed platforms. The 3DMC has a main boom that can be hoisted, lowered, slewed and extended. This provides movement in all axes to allow for full three-dimensional compensation. It has been designed for easy installation and makes use of the existing hydraulic power unit and control system of the crane so all operations are performed from the existing interfaces in the crane cabin. When not required, the 3DMC simply remains fixed to the side of the crane's knuckle-jib allowing normal lifting operations using the main and whip winches. MacGregor's growing market presence was further strengthened in 2016 when it announced its participation in a pilot project pioneering the use of Nemos. It is an innovative system that generates electricity from waves, but is ideally suited to work in combination with offshore wind farms, where it can share electrical infrastructure. This lowers the levelised cost of energy (LCOE) and smooths fluctuations in power-generation, therefore supporting greater commercial viability of renewable energy capture. For its part, MacGregor is supplying highly-specialised winches. MacGregor will be available to discuss these developments and more at Offshore Wind Energy 2017, Norwegian pavilion, stand N-D50.